Sat., June 15 People's Choice Concert! Doors open at 6:45pm. Come at least 15 minutes early to sign up for the Open Stage. Feel free to bring food and non-alcoholic beverages with you to eat before showtime. The Open Stage (maximums: 10 minutes/2 songs or pieces) normally lasts from 7:30 to 9:00, followed by a break, and then the Open Circle runs from 9:15-10:30. In the Open Circle, everyone present is invited to sing a song, read a poem, tell a story, request a song, or pass; songs are often participatory. It's a great place to perform for the first time or try out new material! People's Choice Open Stage/Open Circle (January through April): The Open Stage part of the evening involves People's Choice audience voting; top vote-getters earn a spot in the June People's Choice Concert! People's Choice acts get a bonus for multiple performances (different months), but many acts have won a slot just from one appearance. Tell and bring your friends! Join us on Friday, May 17, for a performance by The DeMasi Brothers, with Anam Owili-Eger opening! 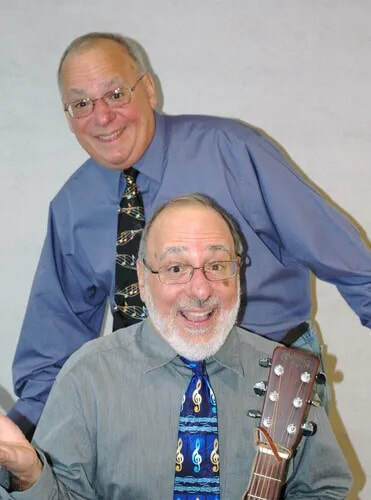 Twin brothers Joe and John DeMasi are award winning contemporary folk singers, songwriters and recording artists whose music is imbued with their values of love, inclusion, understanding and worth and dignity for all. With Joseph on guitar and John on fiddle and guitar, The DeMasi Brothers bring a unique musical experience full of wit, humor, intellect and poignancy to every concert and show they perform. They write songs that address our current political situation that are insightful and hard-hitting. Joe and John began their folk music career in the folk clubs and coffeehouses in and around New York City where they were born and raised. As part of the 80’s folk music revival scene they appeared regularly at Greenwich Village’s famed music club “the Speak Easy” and were featured performers on the “Fast Folk” music series. They shared the stage with such folk legends as Tom Chapin, Christine Lavin and Oscar Brand and have appeared regularly on NPR. They currently travel the country performing musical services, special music and musical concerts at folk clubs, progressive churches, adult communities, and concert halls. For more information, visit www.thedemasibrothers.org . "Anam Owili-Eger is way up there with the new school of multi-talented Philly singer songwriters." -- Straight No Chaser Magazine (London, UK). Growing up with a charismatic, hard-drinking grandfather and an insightful yet mentally unbalanced grandmother who (somewhat illegally) home schooled him until he was nine, Anam Owili-Eger dreamed of becoming an astronomer. Instead, he evolved into a "jazz-soul dreamboat" (A.D. Amorosi, Philadelphia City Paper) whose musings on everything from loneliness and love to paranoia and politics have led to acclaim as "one of the best new songwriters of the past 10 years" (Tim Dillinger, Stave Magazine). Defying genres at every turn, Anam's edgy, adventurous and thought-provoking alternative soul music calls to mind such diverse artists as Stevie Wonder, Tori Amos, Gil Scott-Heron and Bjork. "Playing it safe by doing the same thing over and over is creative suicide," says Anam. "So I suppose in that sense, I've decided not to kill myself." Anam was a Folk Factory People’s Choice winner in 2018. Doors open at 7:30, and the show will start at 8:00pm. Admission is by requested donation of $11 to $40 (sliding scale, online or at the door), half price for no or low wage, with children under 12 admitted free. Wheelchair accessible. Childcare is available with advance registration; by May 13 if possible, by calling (215) 848-6246. ​The Folk Factory, based at the Unitarian Universalist Church of the Restoration in Mount Airy, is a forum for people interested in music of all kinds and progressive social change. Facilitated announcements of progressive events (marches, boycotts, etc.) can be made before the start of each event. The Folk Factory is a kindred spirit of the People's Music Network for Songs of Freedom and Struggle, co-founded by Charlie King and Pete Seeger. Regular concerts are normally on the first or second Friday or Sunday of most months during the academic year, and an Open Stage/Open Circle is held on the fourth Thursday of most months. To volunteer or for more information, call (215) 848-6246. If you have snail mail and/or email address changes, deletions, or additions, you can call us at 215-848-6246 or email us at polson@igc.org. You can send any financial contributions (we suggest $5/yr or $15 for 5 yrs to help cover our copying and postage costs for snail mail, and other donations are gratefully appreciated!) to The Folk Factory, 6900 Stenton Avenue, Philadelphia, PA 19150.